We are also pleased to offer the convenience of our online pharmacy - which will ensure that your pet's medications and food are always available and will be delivered directly to your front door! When considering options for purchasing medication and your pet's food, pet owners have many choices, including online pharmacies and mail-order catalogs. If you want to be sure to get the most value for your dollars, as well as convenience and the best customer service, call us or visit our online pharmacy for your next prescription or medication refill. 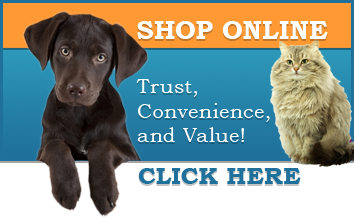 When you purchase medications from our online pharmacy, you can rest assured that your pet’s medications were obtained from safe, reliable sources and stored under optimal conditions.